So a month has gone by with no posts. I was curious to see if anyone would notice and then I got an email from a former member of the FIRE blog, Judy. who along with my friend Rita and another reader, Carmina from Romania seemed to be the only people who have commented lately. The posts are time intensive with photos and photo editing. I was discouraged. If you have been reading you will remember I found my birth mother's side of the family. One of my great nieces was having a baby and it was a great excuse to make another quilt. 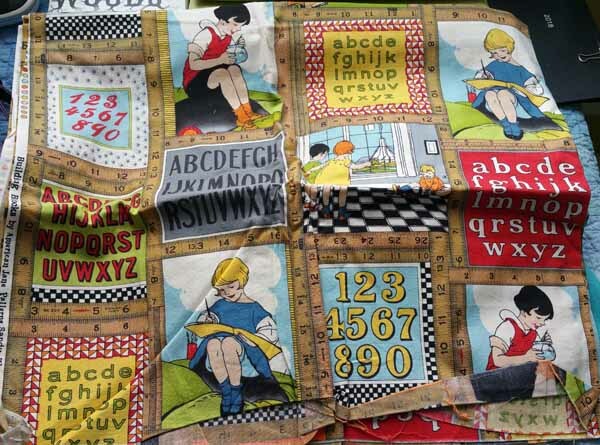 I bought this great fabric years ago to make a baby quilt for someone else which never got made. I showed it to a pregnant friend and she liked it so I am making it for her November baby. Meanwhile my great niece, Shaye, picked out these fabrics for her baby. 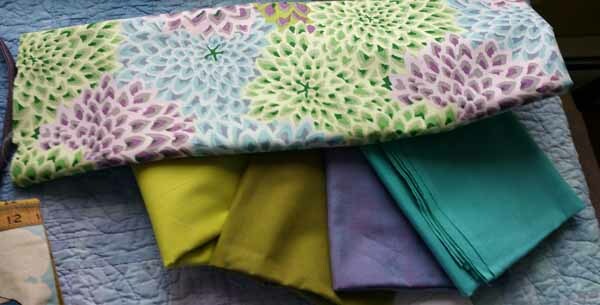 They were baby soft, Kaffe Fassett and the biggest pain in the neck to work with. Of course half square triangles are on the bias and these blocks squirmed and stretched and made me sorry to have chosen them. They were beautiful but frustrating to work with. Looking back I should have starched them within an inch of their life - like cardboard. That might have leveled the playing field. I managed to get all the rows sewn and stitched into a rectangle. Next post, the BIGGEST problem. I did keep looking all month for a new post but figured you were busy with prep for your workshop. Hei Beth, when I have time, I read all the posts, but the last half year I was so busy producing work for my two exhibitions, that I didn't read anything. I have to start with that again and also start to react. So this post of you put me back in focus. Lovely fabric your niece chooses, but difficult to work with indeed. Wish you good luck with it. Many greetings! Thanks Eke. I have been following YOUR busy schedule and saw photos of you demonstrating you paint. See, I knew I wasn't the only one reading your blog! It's one of the few that I visit every day, so I was having withdrawals! Sorry you had trouble with your triangles. The first class I took in making quilts, the gal insisted we spray starch the fabrics to within an inch of their lives, so I guess it makes a difference. Thanks Judy. And I am enjoying being back on Blogger!! I love the colors you have chosen for the quilt. Triangles have always scared me. I learned a quickie cheater way to make half square triangles as well as flying geese. SO liberating!! Thank you Gabriele. I am too!! I'm glad too. I read all of your posts. Thank you Tina. Scheduling new post took a lot of yesterday (when I should have been organizing the Art Greenhouse) but I really did enjoy it. I am glad you are back, I missed your posts. Hi Jody. Glad you are back commenting. I hope your health is as fabulous as the sunny Canadian summer!! Yep--checked everyday but thought you were too busy prepping for the workshop. Glad to have you back! Thanks Kathy. About to go out for some last minute prep before Friday. Might even make a book!! I'm glad to find news from you, I missed your posts. Of course, we can not always be active on the Internet. Lately, I also was not quite active on the net, because I did not even work very productive ... I became more comfortable and I like to read more now. I do not feel very motivated to finish some things started long ago ... how do you do in this case? Hi Carmina. I am pretty much always doing something. My parents used to say, "Can't you just sit down a minute" and the answer is no. I also live in a tiny town of 2500 and not much is happening. You live in a fabulous city with loads of art shows and cultural activities. That is probably the difference. I am always pleased to read your blog and enjoy the exhibits, trips and cultural events!! My lack of comment was not due to lack of interest. I'd noticed the absence of posts. First thought you were busy preparing for your workshop. I did begin to worry. almost emailed to check in. But...I didn't. I tend not to comment, since my blog perusal is usually random and quick. Hope you're having lots of art fun! i AM here and keep those posts coming!